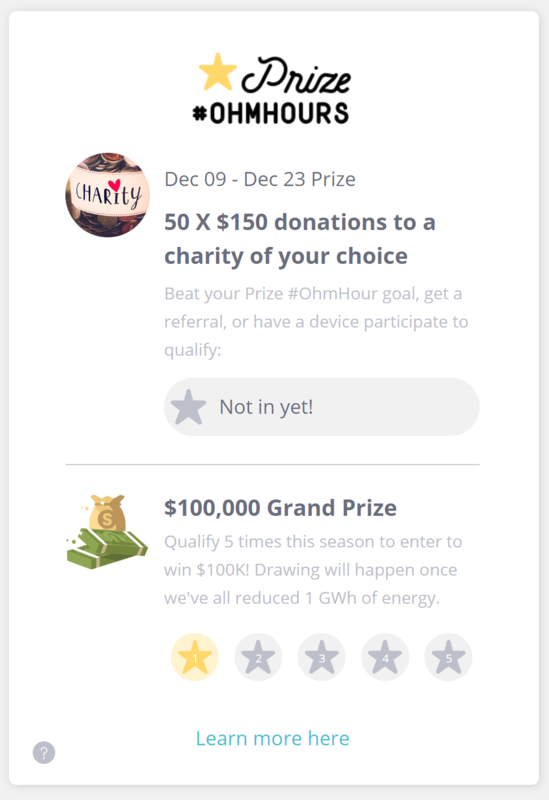 Why do I have less stars for qualifying for the $100,000 Grand Prize than I have won Prize #OhmHours? You can only be entered in a Prize sweepstakes once for that sweepstakes's time-frame. Or, once every 2 weeks. So for example, The "50 x $250 Amazon Gift Cards" sweepstakes ran for 2 weeks, from Nov 11th to Nov 25th. If you were to win 2 or 3 Prize #OhmHours during that time, you'd still only be entered once for that 2 week sweepstakes, and once for the Grand Prize sweepstakes. Once that current prize's 2 week time-frame ends, you'[ll be able to qualify for the next prize, and get another start towards the Grand Prize.